I’ve been in the lookout for a new bag for months now. I wanted a bag that isn’t too casual, yet something that I can bring when I travel. Pacsafe came to my rescue when they gave me the latest model in their women’s bag line: the Toursafe Handbag. I just got the bag yesterday, and haven’t really used it yet, so I’ll just write about my first impressions of it. 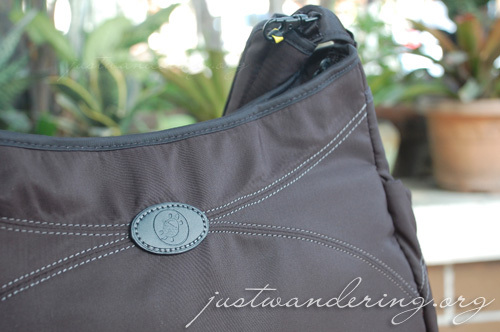 The Toursafe Handbag comes in three colors: Taupe, Tabasco and Black. I was happy that they gave me the black as I requested, because it goes with everything and looks a lot more formal than the other two colors. The lining inside is a lovely shade of lilac. The inside of the bag is every OC’s heaven. There are two zippered pockets for valuables or important documents like passport, tickets, booking confirmations. There are also pockets for pens, cards and electronic gadgets like phones and music players, and a key clip so you don’t have you rummage inside your bag for your keys. Pacsafe is known for its anti-theft bags and travel accessories. The Toursafe Handbag features their patented eXomesh Slashguard in lower front, lower side and bottom panels and a slashproof shoulder strap. This gives you the peace of mind when traveling (or even when you’re just going to Quiapo). For added security, the zipper can also be secured so no one can open it without you noticing. Unfortunately, I got the bag just as I am finishing my travels for first quarter 2010. Still, I have a couple of mini-trips lined up, and I can’t wait to take this bag out for a spin. Pacsafe is available in Manila in all Travel Club branches, Brat Pack, Rustan’s, Hahn, ROX, I Studio, I Gig, Flight 360 and Bombproofgear. A huge thank you go out to United Limsun for the bag and the ProSafe 750 lock. wow… congrats with the new bag. Nice bag…what’s wrong with the “Tabasco” color? You’re right though, black goes with everything. Is it big enough for a standard-sized laptop? Perfectly sized then. I tend to go with larger bags, since the kid’s still in diapers. LOL. Also, you know I love the color red, so I’d probably opt for their Tabasco color too. Heh heh…I was waiting for the “what’s in my bag” post of this one. You know I love to see what you’re carrying, Nina! where did you bought it? online? The name of the Pacsafe model I used eludes me, but it was a messenger/handbag with adjustable straps. Even though opening the main zipper was a bit difficult to open because of the security lock, I was able to walk with confidence AND secure my stuff. I picked black because it goes well with everything. And it’s not at all awful-looking. My mother used a Pacsafe SlingSafe 100 Sling Purse Bag. Hers had to be the most guarded bag since she was carrying our Eurail tickets and hotel vouchers. Happy to report that we didn’t lose a thing.